There was a lot of talk about kisses and hugs this week…we’re working on the letter X in the alphabet! We read one of our favourite books, Alphabet Mystery by Audrey and Bruce Wood, as our literacy connection (and indulged my fondness for mystery books of all kinds). Only two more letters to go and we will have finished teaching all of the letter names, sounds and formation for upper and lower case letters. Our children will show you their Alphabet Books on Thursday, at their Student Led Conferences. You will be amazed at their progress this school year. The Earth Rangers came by with a special presentation on the protection of animals and their habitat. 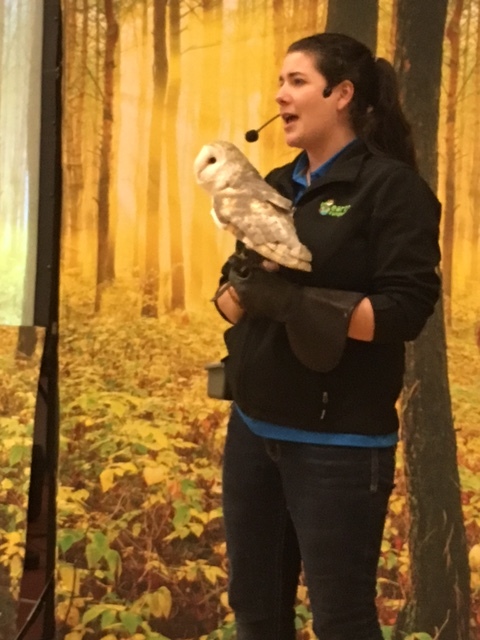 Special visitors included Quillo the porcupine; Crimson the Tegu lizard; Katira the falcon; and Sonic the barn owl. 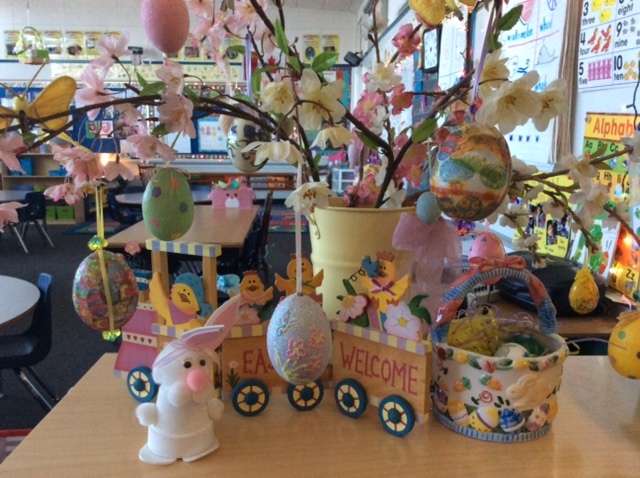 The Easter Bunny came early to the Kindergarten in the way of some very fun crafts and activities. First up — wax crayon resist patterned eggs. We had quite a bit of fun dreaming up patterning ideas using lines, dots, letters and symbols with our crayons. Then, we applied a paint wash using tempera paint pucks. 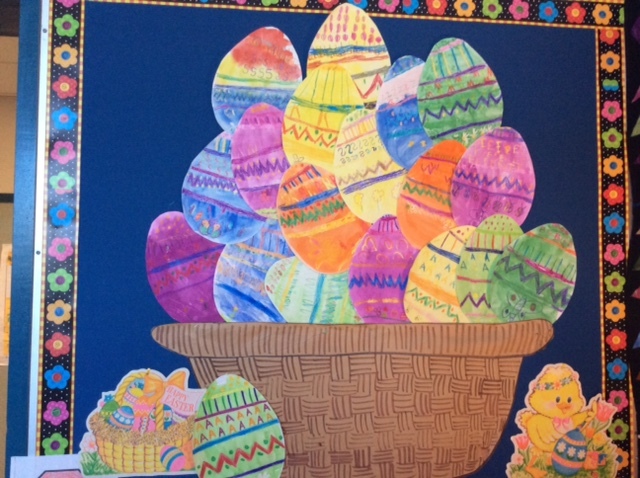 Our efforts created a beautiful Easter basket full of eggs. Next — Easter egg decorating! 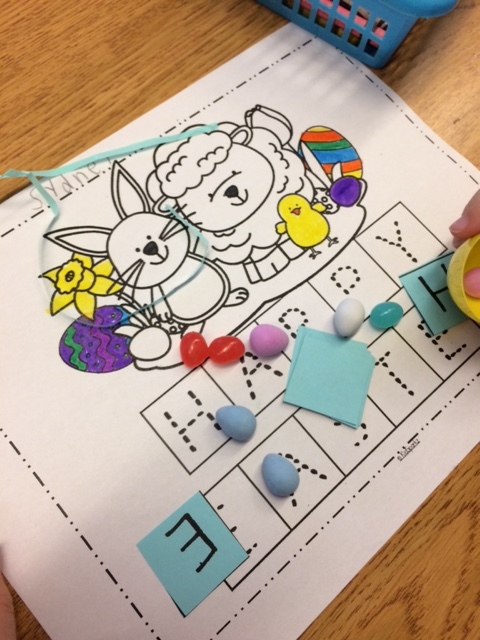 Thanks so very much to our parent volunteers who rolled up their sleeves to help our children make two kinds of decorated eggs: a simple wax crayon resist egg, and a batiked egg. We used crepe paper to make our dye (pour boiling water over the cut up crepe paper to drain the colour; let it sit overnight and remove the paper in the morning). The children already knew what to expect from the wax crayon resist technique, but using pipettes to dribble colour on their fabric wrapped egg was a new method. Library Book Exchange on Tuesday. Please bring your library book into the classroom for the library book bag. Thursday, April 20: Early Dismissal at 1:50 pm for Kindergarten students only. Please be on time. If you child attends Camp Ridgeview, we would appreciate it if you could inform them of this change in schedule. Student Led Conferences: We’ve got just about every family signed up for Student Led Conferences on Thursday. Please remember to bring your Kindergarten child to the conference. We would prefer that arrangements be made for siblings so that you can focus on your child’s conference.